One of the great things about the growth of the University of Louisville over the past couple of decades was that one always felt like he or she was an integral part of helping to transform UofL from a sleepy urban school to a dynamic and growing university. It hurt and hurt deeply when some of the architects of that movement, the people in leadership roles, the people one got to know so well, the people one respected as friends and visionaries, were unceremoniously dismissed despite of what they had accomplished at UofL. Not surprising that some influential individuals in the community would want to exercise control over the University. Not surprising either that many supporters want to keep an arm’s length from people who forced change, sometimes traumatic, upon the institution. Dr. Bob Hughes, former chairman of the UofL Board of Trustees and the UofL Foundation, often indicated that the “wine and cheese crowd in the East End” was behind the upheaval at the school, wanting their own people in charge. With the Board of Trustees now under the thumb of J. David Grissom, a financial advisor to many of the community’s wealthiest families, Hughes’ theory definitely has credibility, even given all the charges of financial mismanagement and malfeasance that has been alleged. 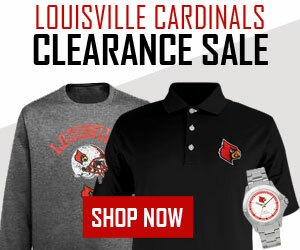 There’s no denying that UofL is now under much different oversight. Not that that is necessarily a bad thing. Getting the community’s blue bloods invested in the future of the school would be a very positive development. 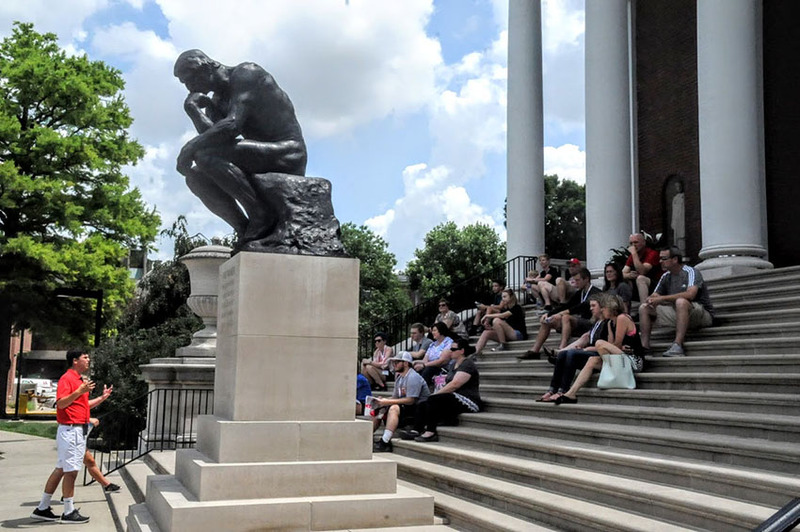 Opening up new relationships and even deeper purses may be just what the University of Louisville needs to achieve higher levels of excellence. 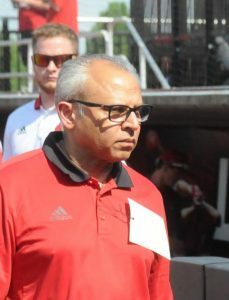 Some have criticized the school’s success in athletics, believing it may have impacted UofL’s lack of respect in academic circles. Some believed Tom Jurich’s fundraising success in athletics was crippling contributions to academics. Ironic coming from John Schnatter, who pledged $19 million in Papa John’s stock to UofL athletics. The board most prominent recent hire, that of Neeli Bendapudi as the school’s 18th President, appears to have been a master stroke. She’s an individual with a successful track record of fundraising at the University of Kansas. But equally important, she seems to have the ability to communicate effectively with people from all walks of life. Plus, she has indicated that she very much wants UofL’s success in athletics to continue. It’s going to take a while for Vince Tyra to be loved by Louisville fans as much as Tom Jurich. 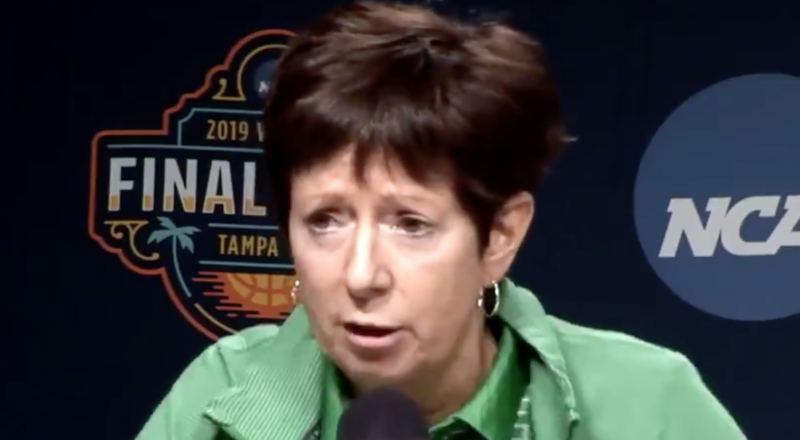 But Tyra has been effective in retaining successful coaches and unquestionably wants UofL athletics to continue competing at the highest levels. Consider the school fortunate to have such an individual eager to step up when UofL needed him most. Chris Mack, the new UofL basketball coach, is the exact opposite of Rick Pitino in many ways. But like Pitino he’s certainly not bashful when it comes to challenges while acknowledging the Louisville job and fan base as among the best in the nation. Even some of the board’s most ardent critics have admitted that these hires were great choices, giving many of them second thoughts about the motivations of some board members. Could it be that the old money crowd actually knows what it’s doing, cares about the school and wants UofL to pursue even higher aspirations? The people currently in control have had much to deal with over the past two years, making some difficult decisions. They’ve done it in a difficult environment, and their decisions have not always been popular. Be they business or civic leaders, they are responsible to putting UofL back on the right path to respectability and prosperity. Grissom recently decided the board, having successfully dealt with many of the school’s issues, would no longer have to meet monthly, going back to the old schedule of meeting quarterly. That’s another good sign, indicating that the Board of Trustees has high levels of trust in Neeli Bendapudi’s leadership abilities. Now with so many of the problems in the past, the University can begin to restore many of the relationships that made the progress possible in the past two decades. 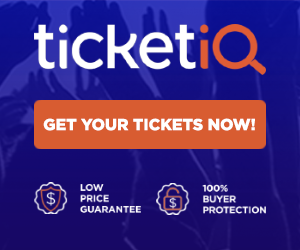 Bendapudi may be the right person in the right place at the right time, with her unique ability to relate to the old money crowd and the everyday fan and supporter. Time to look forward again, this time with a deeper base of support. Christy Brown is the reigning matriarch of the Brown dynasty in Louisville. 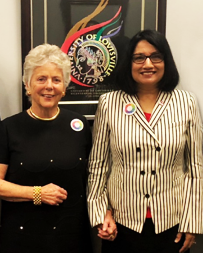 Old Louisville money spoke loudly about Neeli Bendapudi’s future as the new President when local philanthropist and socialite Christy Brown announced this week she was giving $5 million to the University of Louisville. “Our university has today turned a glorious page, and it’s begun a new chapter with the arrival of our fabulous new president,” said Brown as she made a pledge to a new UofL Envirome Institute to study the effects of the environment on individual health. The matriarch. The grande dame. Christy Brown had spoken. Brown was, in effect, announcing her blessing for Bendapudi just five weeks after she assumed the office at the UofL on May 15th. The importance of her actions can’t be overstated. The widow of the late Owsley Brown II is the matriarch of the powerful Brown family dynasty that derived its fortune from Brown-Forman Distillers. The influence of the Browns and others in the extended family is pervasive. It was Christy Brown, remember, who hosted Prince Charles in Louisville during his four-day visit to the U.S. in 2015. The family also hosted Queen Elizabeth at the Kentucky Derby in 2007. Christy Brown says Neeli Bendapudi’s presence turns a glorious new page for the University of Louisville. Making the guest list for Brown’s parties or events she attends is a must for the socially ambitious. She’s always the center of attention in any activity in which she participates, with ambitious admirers eager to greet and be seen with her. Standing behind Brown at the UofL announcement were daughter Brook Brown and her husband Matthew Barzun, who was U.S. Ambassador to Great Britain under Obama. Barzun was once mentioned as a possible candidate for the UofL presidency. Also there was Augusta Brown, married to Gill Holland, a prominent Louisville developer credited with developing the NuLu area. Close family connections with the Browns include the Fraziers, descendants of Garvin Brown, who founded Brown-Forman. The late Owsley Brown Frazier, another BF executive, gave UofL a gift of $25 million in 2011. It remains the largest contribution in the school’s history. Another generous contributor was Steve Wilson, married to Laura Lee Brown, cousin to late Owsley Brown II. The founder of 21C Hotels, Wilson was the UofL Trustee who started the revolt against former President Jim Ramsey in 2015. An open records request to UofL indicated that Wilson and his wife had contributed more than $1.3 million before Wilson resigned in 2015. 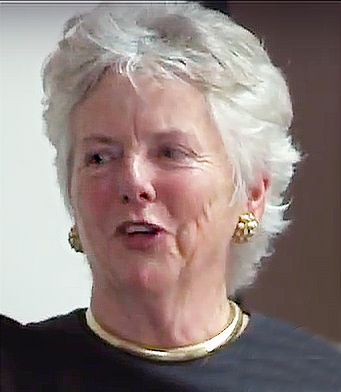 Sandra Frazier, the daughter of Amelia Brown Frazier and the niece of Owsley B. Frazier, is a member of the University of Louisville Board of Trustees. She’s also the owner of Tandem Public Relations and, more importantly, a member of the Board of Directors of the Glenview Trust Fund. The person who runs Glenview Trust just happens to be J. David Grissom, the Chairman of the UofL Board of Trustees. Brown family members and their foundations are known to use Glenview Trust Co., currently managing an estimated $6.5 billion in assets. Clientele reportedly include 500 of the area’s wealthiest families. Bendapudi has been non-stop coming aboard in mid-May, meeting with one decision maker after another. Recent tweets included photos of her with power hitters David Jones and David Jones, Jr., of the C.E. & S. Foundation, and John Schnatter, of Papa John’s. She has also met with leaders of the J. Graham Brown Foundation, the Humana Foundation, the David Novak (Yum!) family, and Kosair Charities, as well as the Governor, the Lieutenant Governor, Senator Mitch McConnell, the Louisville delegation to the General Assembly, the Kentucky Council on Post Secondary Education, the Faculty Senate, the Staff Senate and the Student Government Association. Bendapudi has been constantly on the go, touching all the bases with all the decision makers, the people who will make UofL whole again. Having the blessing of Christy Brown is a significant milestone, opening many more doors for the new administration. A new chapter, indeed, for the University of Louisville. Al Benninger, a veteran of World War II and an honorary member of the University of Louisville stats team, returns to Louisville after a special D-Day Bluegrass Honor Flight to Washington, DC. (Charlie Springer photos). 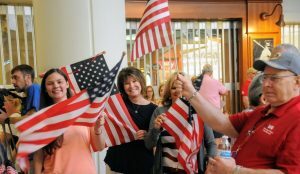 Sixty-one World War II veterans were welcomed home by hundreds following a special Bluegrass Honor Flight that coincided with the 74th anniversary of D-Day. A special night in Louisville, a rare opportunity to thank troops who helped to preserve a way of life a long time ago. 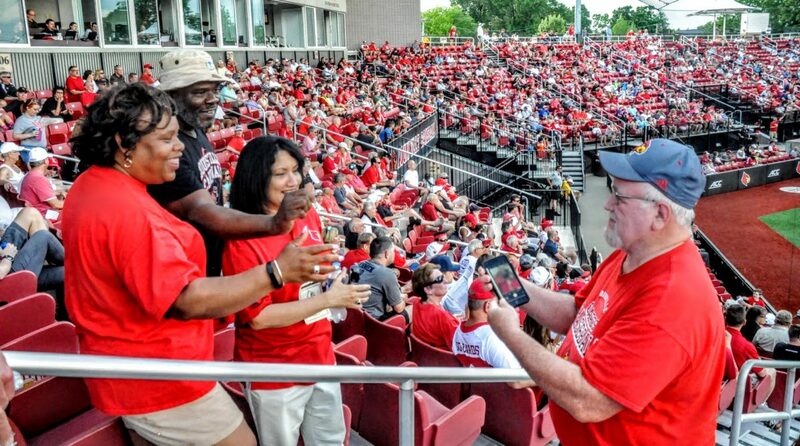 Among the participants was Al Benninger, who was a member of the University of Louisville stats crew for 35 years. He was doing stats when UofL crew was selected to do the NCAA Tournament in 1969. He has been a honorary member of the stats crew, still sitting on press row since retiring in 2006. 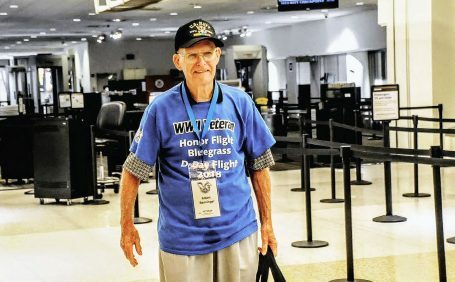 Benninger, who served in the Navy, and his fellow veterans were flown to Washington for an overnight trip to see all of the war memorials, including the World War II memorial and the Tomb of the Unknown Soldier at Arlington Cemetery. They were warmly greeted, receiving heroes’ welcomes at every stop along the way. 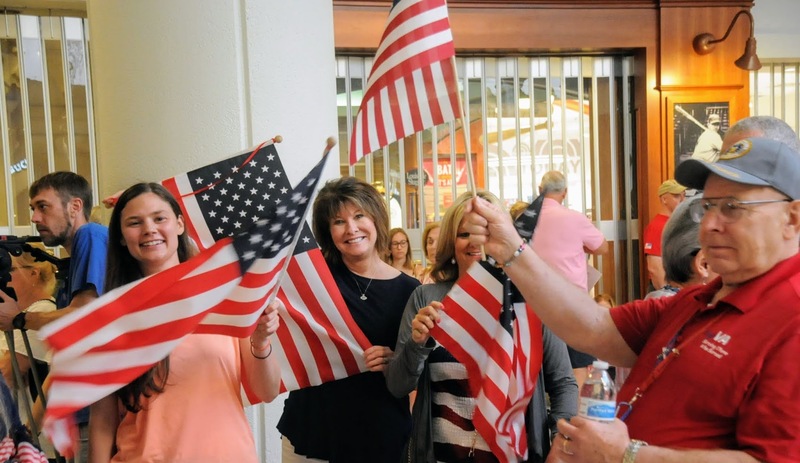 The veterans returned to Louisville at approximately 7:30 p.m. on June 9th. 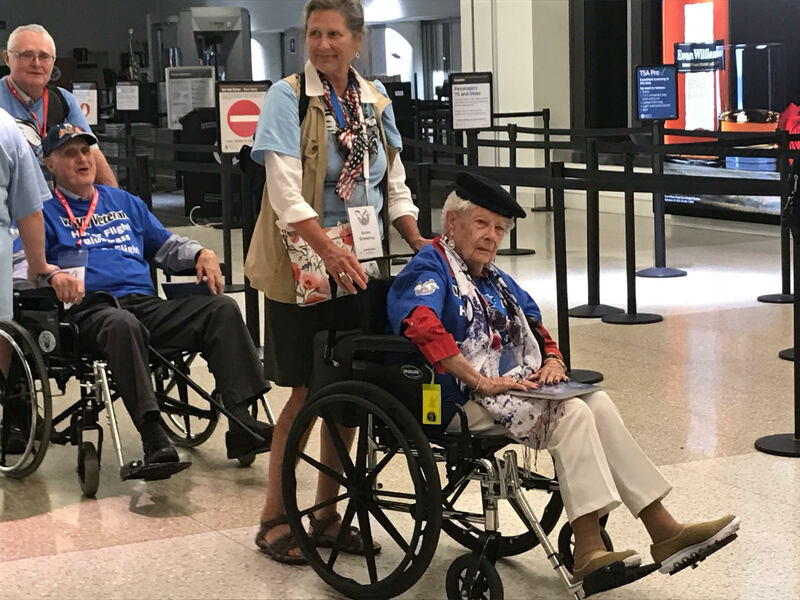 But because there were so many veterans in wheelchairs (over 45 of them), the flight crew needed about an hour to get all of them off the airplane. A huge roar went up as the veterans and their escorts came into view in the terminal. 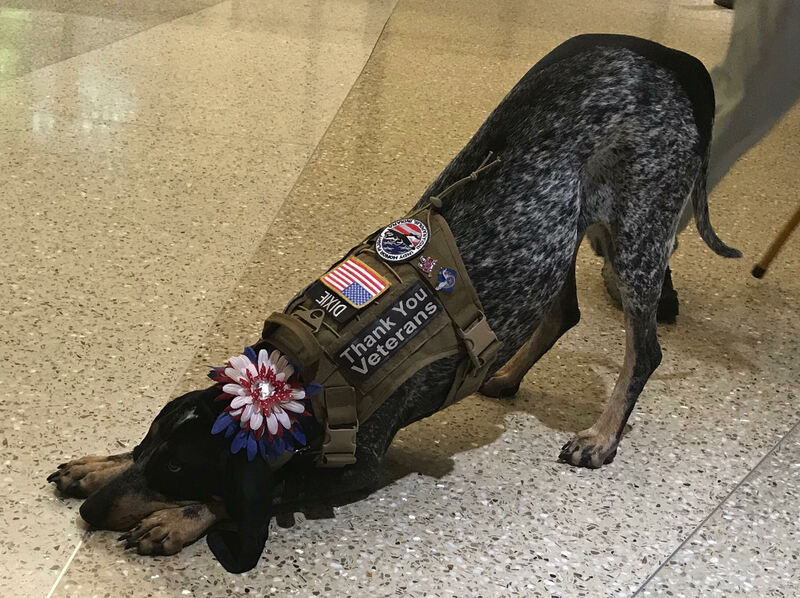 They were greeted by representatives of every segments of the military service, as well as groups from the American Legion and Disabled Veterans. The Thoroughbred Chorus was on hand, as was a special bagpipe band. 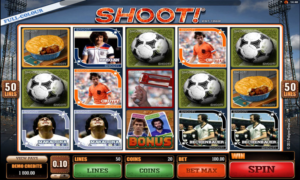 A celebration evoking joy, tears and memories of more innocent times. A chance for Louisvillians to say thanks for individuals who put it all on the line for their fellow Americans. 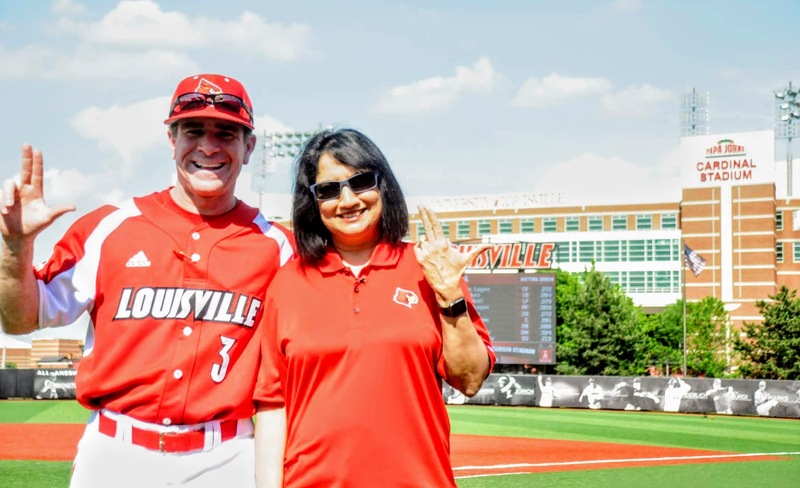 Baseball Coach Dan McDonnell and President Neeli Bendapudi at her first University of Louisville baseball game (Charlie Springer photos). Neeli Bendapudi was scheduled to throw out the first pitch at the University of Louisville – Indiana University baseball game on Tuesday. A few days earlier, however, she had suffered a torn rotator cuff while unpacking at her new UofL home. 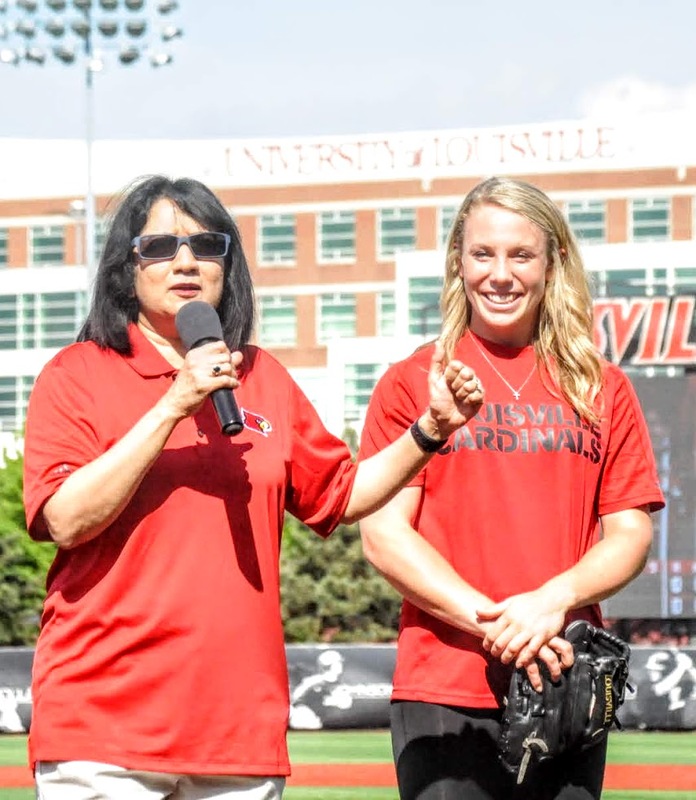 UofL softball pitcher Meagan Hensley threw out the first pitch for UofL President Neeli Bendapudi. Meagan Hensley, a UofL softball pitcher, would happily throw the ball for Bendapudi at her first athletic event as the new University of Louisville President. She was accompanied by her husband Venkat, a senior lecturer in the School of Business at Kansas University. 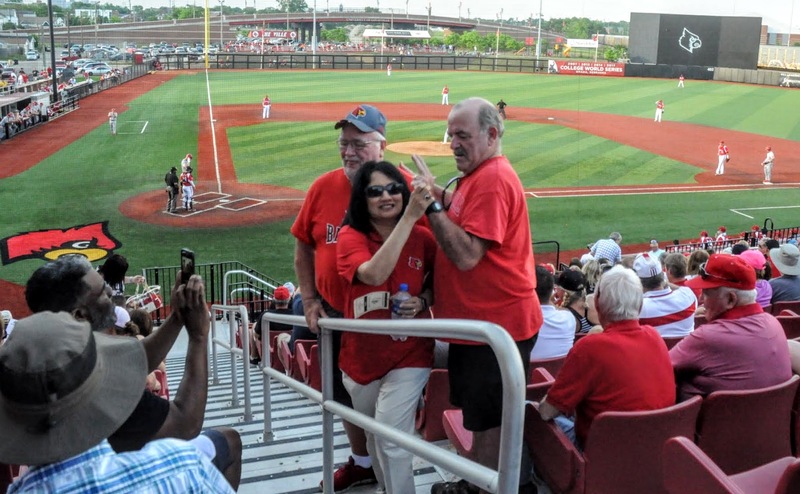 Bendapudi departed Jim Patterson Stadium shortly after the game started, presumably for other UofL business, only to return during the seventh inning. She was seen walking the steps in different areas of stadium, introducing herself to many of the 2,257 fans in attendance. Venkat Bendapudi is a senior lecturer in the Business School at Kansas U. People were eager to get to know her, letting her know how excited they were to have her in Louisville. Many of them wanting to have their pictures taken with her. 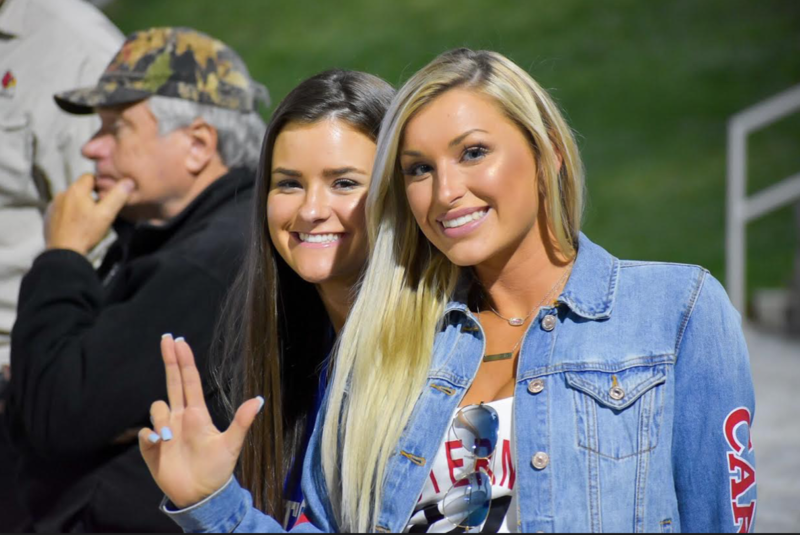 Neeli, in return, happily posing with them, frequently throwing up the L sign, laughing, smiling, loving every minute of the interaction with the fans. This observer actually had a couple of minutes before the game to chat with her, finding her to be engaging, warm and enthusiastic. She makes a great first impression with everyone she meets, exuding a sincere and determined desire to do great things at UofL. She’s clearly excited to be in Louisville and was busy cementing friendships for the University at her first UofL baseball game. Watch for her soon at a Louisville sporting event near you. Neeli Bendapudi was everywhere in Jim Patterson stadium it seemed, engaging and getting to know UofL fans on her first day on the job. A new person in the President’s Office at the University of Louisville today, ushering in a new era. Surely an end to the divisiveness that has plagued the campus for the past three years. 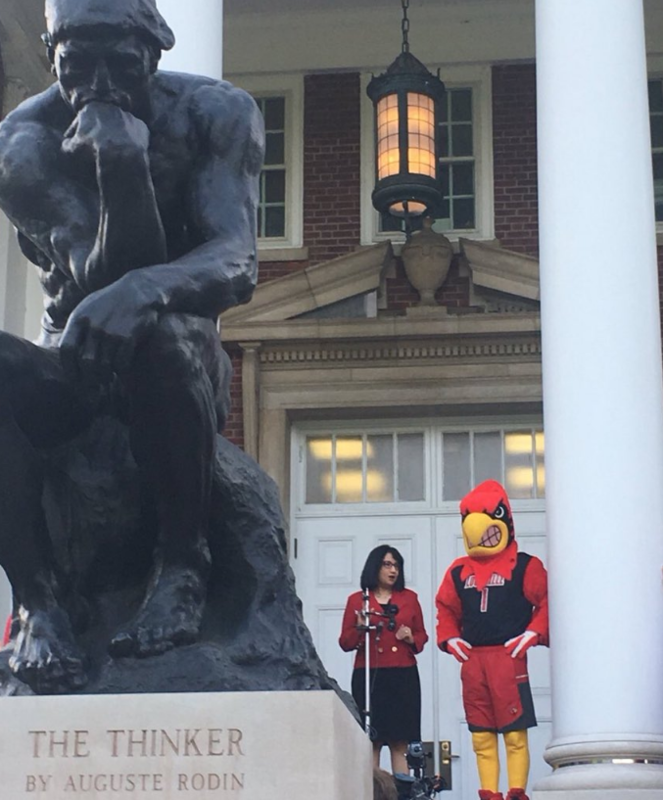 Dr. Neeli Bendapudi, the 18th President at UofL, was welcomed by approximately 200 students, staff and faculty members to her first day on the job on the steps of Grawemeyer Hall early Tuesday morning. And with that milestone, one transformation is complete, and the vacuum has been filled. A new day in more ways than one for the school that was founded 220 years ago in 1798. Over the past several months, the University has also selected a new Chief Operating Officer, a new Dean of the Brandeis School of Law, a new Dean of the J.B. Speed Engineering School, in addition to a new Athletic Director and a new Basketball Coach. One of the few key administrative jobs remaining open is that of Provost, who will work side-by-side with Bendapudi on raising the school’s academic profile. Bendapudi seems to be exactly what the University needs right now, with an impressive background in marketing and fundraising at Kansas University. She obviously appeals to many UofL support groups, with her status as a female, as a person of color, and with her foreign birth. She has stressed her emphasis on diversity and inclusion at every appearance thus far. Especially refreshing is that she embraces a wider definition of diversity than the tired racial themes, including diversity of thoughts and beliefs. That would be a positive direction, considering the negative fallout from liberal mandates at many U.S. universities. The University had made great strides over the past two decades before getting embroiled in a series of controversies. 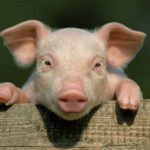 Some of them the result of the previous administration’s actions, others stemming from political agendas, others from liberal and conservative differences, and still others from state rivalries. UofL has survived, however, largely because the school means so much to so many people throughout the community and state, and is ready to start moving forward again. We wish Neeli Bendapudi well, looking forward to some fresh new approaches, using creative and innovative ideas to help the University of Louisville not only survive but become an even more positive influence in our lives.